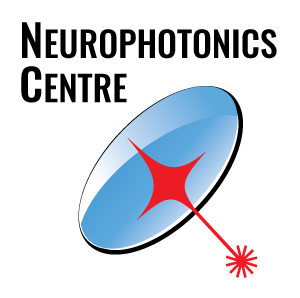 The Neurophotonics Centre is a unique, state-of-the-art national facility for advanced Biophotonics approaches dedicated toward the understanding of the brain, the development of diagnostics for brain disorders and phototherapy. The centre brings together a team of researchers, scientists and staff who develop and use the most innovative methods integrating neuroscience and physics. This innovative facility, located at the Institut universitaire en santé mentale de Québec (IUSMQ), has received >60M$ of funding from the Canadian Foundation for Innovation and partners, the Quebec Government and more recently, a Canada Excellence Research Chair in Neurophotonics, held by Dr. Pierre Marquet. The Centre presently occupies 30,000 sq ft. It includes 14 clean rooms, 46 microscopy rooms, wet labs, cold rooms, tissue culture rooms, histology rooms, and a workshop for instrument design. The Neurophotonics Centre, through its ‘Frontiers in Neurophotonics’ Summer school, contributes to the training of highly qualified personnel in this specialized field. Moreover, this national facility offers services to the Canadian and International scientific communities through one or more of its platforms. The mission of the Neurophotonics Centre is to provide Canadian scientists the tools to use and develop the approaches of tomorrow to help solve the mysteries of the brain. It is also dedicated to the training of a new generation of scientists capable of developing the necessary technology to tackle unsolved brain-related function and disorders.